On the one hand, the recipe follows shortbread’s basic ratio of ingredients (typically one part sugar, two parts butter, and three parts white flour) to produce a rich, crumbly biscuit-like cookie texture. 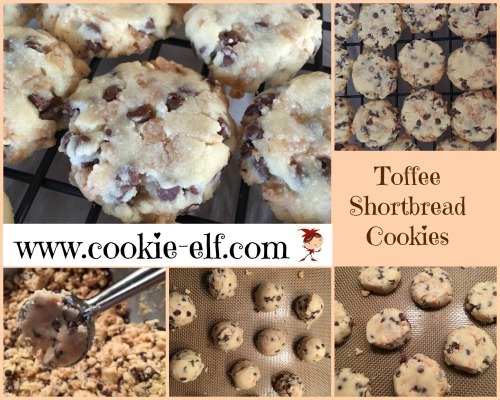 But rather than pressing the cookie dough into a pan and cutting it when it is warm, these delectable individual shortbreads are formed when you scoop dough and roll it into 1-inch balls (as in other molded cookie recipes). Miniature chocolate chips and toffee bits may ooze out a bit when you bake them. You won’t mind. Trust me. In a small bowl, mix together flour and salt. Set aside. In a medium bowl, using an electric mixer on medium speed, blend butter, sugar, and vanilla until combined. Gradually add flour mixture a bit at a time until it is absorbed. Cookie dough will be thick. Add chocolate chips and toffee bits, blending them into the dough with a wooden spoon or with mixer on slow speed. Use a cookie scoop or a teaspoon to scoop slightly rounded 1-inch balls of dough. Roll 1-inch balls in between your hands until they are smooth. Arrange balls on the prepared baking sheet, 2 inches apart. Moisten the bottom of a drinking glass with water. Use the glass to slightly flatten a formed cookie dough ball. Bake cookies for 10-13 minutes or until edges turn a light golden brown. Transfer cookies to a cooling rack. Let the cookies cool completely. As with other shortbread recipes, be sure to use butter, rather than margarine, to give cookies their rich, crumbly texture. If you prefer mounded to flat cookies, then you needn’t press down cookie dough bals before baking them. See more easy shortbread recipes on our Pinterest board.